Bruised and battered after an epic 100-mile protest hike, a group of students arrived at Glasgow University yesterday to confront Principal Sir Muir Russell and were greeted by news their campus could be saved. The students made the five-day walk from Dumfries to Glasgow, protesting against a decision to halt undergraduate admissions at Crichton Campus. Glasgow University, facing an £800,000 financial deficit, decided to withdraw its undergraduate liberal arts courses, with immediate effect. In protest, the group of students – several of them parents – set off from Crichton Campus, Dumfries, last Thursday at 9.30am and finally arrived at the university’s main gate yesterday at 12.30pm. Sir Muir was presented with a selection of essays by Crichton students explaining why they believed Glasgow University must continue there, and a drawing of the Rutherford McCowan Building by local artist Hugh Bryden, who supports their campaign. The presentation was made by six-year-old Caidhn Downes, son of walk leader Wendy Downes, 33, a single mother, who completed the trek in time to graduate today with an honours degree in liberal arts. A review is currently in place, led by the Scottish Funding Council, which allocates resources to universities and colleges, to develop a new funding strategy which will allow undergraduate teaching to recommence at Crichton in future. Sir Muir told the walkers he was still hopeful that a more immediate solution could be found. He said: “We were highly disappointed when the Scottish Funding Council was not able to help us eliminate our funding deficit, but we are now in new discussions with stakeholders and I am hopeful we can find a funding strategy which will allow us to break even. “Since the election, there has been a change in the political situation which has thrown some weight back on us continuing to offer undergraduate arts courses there. Another marcher, Crichton graduate Victoria Pyle, 22, from Edinburgh, said she hoped the march would help “reconnect” the two Glasgow University campuses. She said: “We may be in two different places but we are one institution. Crichton is a fundamental part of Glasgow University. It is a common misconception Crichton is full of Dumfries locals who were rejected from Glasgow and Edinburgh. “I chose Crichton for its peaceful campus and its reputation for research excellence. It led me to an excellent job in politics as an information researcher. The demonstrators were backed by Alasdair Morgan, MSP for Galloway & Upper Nithsdale. He said: “I am here because I support the marchers. Glasgow was core to the set-up of Crichton and it has delivered great success so far. 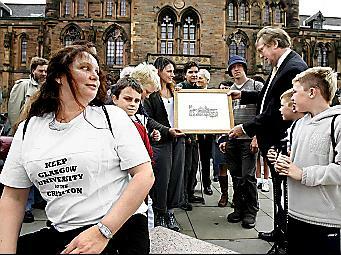 “There is no rational educational argument for Glasgow to leave Crichton. South-west Scotland is deprived of higher education facilities. “We need not just technical courses but also arts degrees, and Glasgow is key to that. This entry was posted in Crichton Campus, Dumfries, Glasgow, Media. Bookmark the permalink.